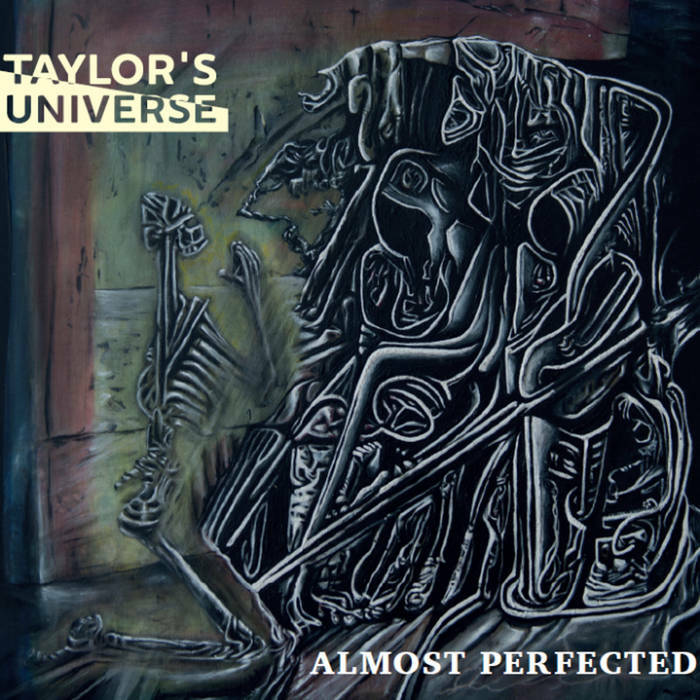 It’s been a good two years since the last new release by Taylor’s Universe (and that’s not counting Across the Universe, which was a sort-of remixed best-of release), but Almost Perfected takes four pieces from Taylor’s back catalog and gives them entirely new arrangements, and using the current version of the band, it was a chance to re-record some pieces that he felt could have been done better, and needed another chance. Most of the current TU members were not around when the original versions were tracked, so the results are quite different, and Taylor has taken that opportunity to give these four instrumentals (save for some effect vocals) new titles at the same time. “Mean Attack” (derived from “Tag Attack” on the Soundwall album) begins gently with sax leading into a trippy groove for about one minute, then a sudden blast of sound interrupts the proceedings, a hint of the coming progressive rock eruption that strikes at the two minute mark with scorching guitar leads and multitracked saxes driving forward with the rhythm section’s full-on power. From the same album, “Totally Greek” has now been transformed into “Definitely Greek (He Said),” which arises slowly from dreamy textures and features some excellent playing by guitarist John Sund and some Minimoog soloing by Thomas Ulstrup, leading to a very unique and animated vocal section featuring regulars Louise Nipper and Jytte Lindberg (the Taylorettes) as well as Pierre Hansson, eventually joined by saxes, keys, more guitar, and the full power of the rhytm section, sinking to a very quiet center section before returning full-power again with Jakob Mygind’s wailing one man sax section leading the way with vocals following. The third and fourth tracks are rearrangements of pieces from Taylor’s solo album Isle of Black, with “Remembering Johannesburg” offering a particularly potent new and expanded arrangement of the original, again with vocals providing backing textures. “Dark Side of Alec” (a reworking of “Mind Archaeology”) presents what is probably now one of the most powerful single pieces (clocking in at over fourteen minutes) in the entire TU canon. The subtle and mysteriously churning opening movement tracks something powerful lying just below the surface, the soaring saxes and weeping guitars slowly revealing a dense forest of sonic brilliance, all of which eventually fades off into the distance, replaced by a dreamy introspective piece that grows and morphs into another power phase with voices pushing everything upward, going forward into a long slow fade. In all, every moment of Almost Perfected is outstanding, certainly living up to its title.